Greg Lee was primarily known for his basketball abilities at UCLA, where he played with Bill Walton. He never played volleyball while at U.C.L.A. Greg Lee's older brother, Jon was also a volleyball player with a "AAA" rating on the beach. 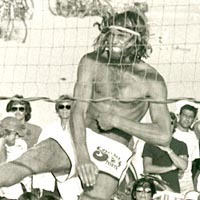 Jon exposed Greg to the beach game at Sorrento Beach in 1970. In 1972, Greg Lee played in his first "Open" at the Laguna Beach Open, finishing second with Ron Von Hagen. His first "Open" victory came with Tom Chamales at the 1972 Santa Barbara Open. Lee advanced to the finals 4 times in 1972, winning twice. He also advanced to the finals 4 times in 1973, winning the Marine Street Open with Menges. His best finish in 1974 was a second at the Manhattan Open. On the 1975 beach volleyball circuit, Lee reached the finals of 10 events, all with Menges, winning all but one. In 1976, Menges advanced to the finals at 7 events, winning all 7 with Menges. On the 1977 tour, he advanced to the finals 3 times, winning all of them. In 1978, he reached 5 finals, winning 4 times. Lee also won the 1981 Laguna Beach Open with Jay Hanseth. Also in 1981, Lee won the Mission Beach Open with Menges. This was his last "Open" title. Greg Lee�s most success came when teaming-up with Jim Menges. From 1973-1982, Lee and Menges played in 30 tournaments together, winning 25, finishing second three times and third twice. They were never out of the top three. Lee had additional victories with Ron Von Hagen and Jay Hanseth. In 1977 Greg Lee would leave the sand to try and play professional Basketball Europe, but he eventually returned to the beach. Lee entered a total of 62 "Open" tournaments, reaching the finals 39 times while collecting 29 tournament titles.